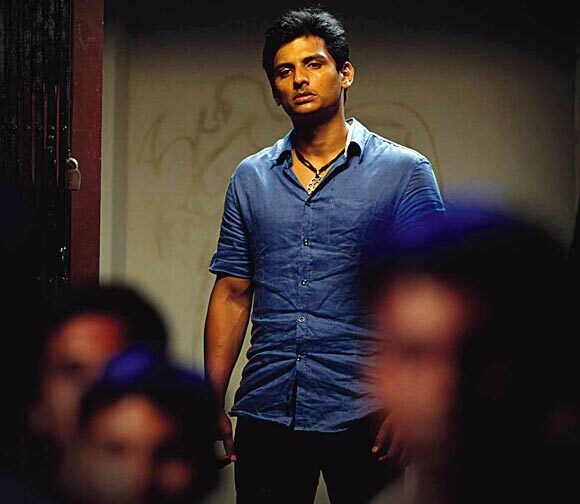 Jiiva is one of the most talented and busiest young actors in Tamil cinema. Starting his career with the offbeat, award winning Ram, Kathrathu Thamizh and E, he moved on to successful commercial films, Dishyum, Ko, Nanban etc. His last films, Ko and Nanban (the Tamil remake of Three Idiots), were huge successes, so expectations of the UTV production Mugamoodi, releasing tomorrow, are quite high. 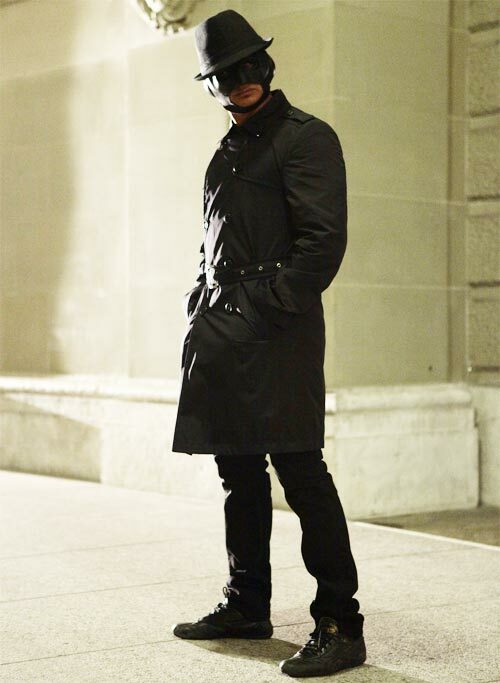 Here, Jiiva talks about the exhausting and exhilarating experience of acting as a superhero and his training in Kung Ku and other martial arts. Were you a fan of superhero comics when you were young? Actually I was not. I was more of a Rambo, Commando fan and also a fan of superhero films. I enjoyed watching Superman, Batman and Spiderman films but I was not really interested in the comics. Then what exactly attracted you to Mugamoodi? As an actor, any new concept attracts me. Also, Mysskin's (the director) treatment has always been new. I have always wanted to work with him. But when he asked me to work in his second film, Anjathe, I felt I was too young to play a police officer. When I saw the film, I felt, oh God, I should have played it! So, it was not the role but the director that made you accept the film? That was the first attraction. Also, Mysskin had been tossing the idea about with me for quite some time. I was quite excited to hear about the treatment he was planning. The script was very interesting. 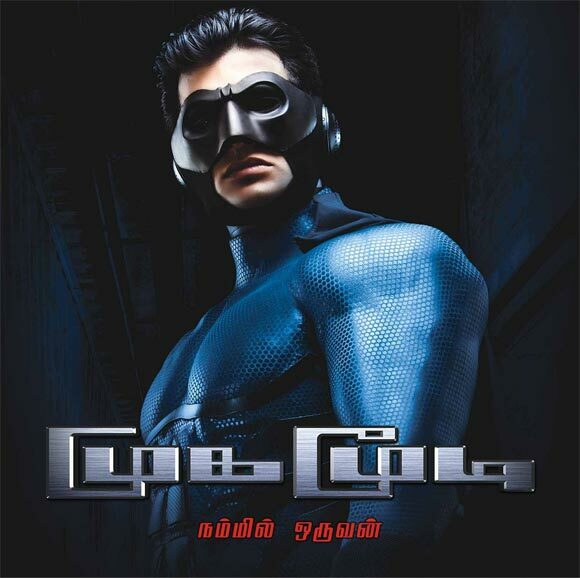 Mugamoodi is each one of us, one of the public, not like the superhero films you have seen so far. He is not a super hero in the real sense. He doesn't have any super powers; he uses his mental and physical powers. Many may have high thoughts but they may not execute them, but this is a man who believes in practising what he believes in. I would say all our Tamil heroes are superheroes! It is true that all the fight masters are from here. Yes, Tony Leung, a legendary action choreographer. He has worked with Bruce Lee! I call him Tony Master! Mysskin told me that he asked you to train in martial arts and he was surprised to hear that you had been training for several years. Not several years. I trained in Kung Fu for four years -- from 1998 to 2002 -- under a master called Sekhar. I stopped after I joined the film industry and found that the fights in films have nothing to do with Kung Fu. Was it out of interest that you learnt Kung Fu? (Laughs) No. I liked to do only one thing when I was a teenager -- play cricket. The rest of the time, I used to sleep. It irritated my father (producer R B Chaudhary). So, he made me go jogging with him at six in the morning at the YMCA. I found it quite boring. One day, I saw some kids learning some martial arts, and I told my father that I wanted to learn that. It was just to avoid jogging. My father would wake me up in the morning to take me to the Kung Fu class. I must have been 16 or so. Looking back, I feel it was really nice of him to do that as those lessons have helped me immensely now. I didn't enjoy learning Kung Fu initially. I had to really stretch my legs and it hurt. But once my body got used to the regimen, I started enjoying it. My body structure changed; the way I stood, the way I walked, everything. My thin body developed muscles. The changes were so motivating that I used to wake up on my own and go alone, and I became the best student. After some time, I also started learning gymnastics. My Kung Fu master Sekhar was a good friend of the gymnastics master Ali. Sekhar Master asked him to teach me gymnastics. My daily routine started with gymnastics and then Kung Fu. When you meet healthy people, you get influenced by them and that was what happened to me. So, all those lessons have come handy in this film? Yes. In some films I have fought like a Kung Fu guy and did somersaults but it never made any sense. But in Mugamoodi, all those actions make sense. Mysskin was initially surprised to hear that I had learnt Kung Fu. I think that was when he felt he had chosen the right guy to do the film! But whatever I have learnt from Sekhar Master was not used in the film. What is shown in Mugamoodi is close combat. It is Win Chun, which I had not learnt before. Did you learn Win Chun for the film? It is much more advanced than Kung Fu. I learnt the basics from Tony Master and the postures were quite tough. I wish I could go to Hong Kong and train for at least a couple of months. I didn't have that much time to do it, sadly. So, in the film, I learnt only what was choreographed for the action sequences. Having done the action sequences, do you feel like learning it professionally? If there is a Mugamoodi 2, I will definitely go and train in Win Chun. The problem here is, unlike in Hollywood, we don't do just one film at a time. So, it is impossible to be thorough in what you do. You just move from one set to another and one film to another. If there is a part two, I will learn it professionally. I want to be the first actor who specialises in Win Chun, Kung Fu, etc. I want the fights in our films to look real like you see in the Chinese films. Tony Master told me I had to make myself free for four weeks so that I can train. Then he wants me to take a break of two weeks and go back again for four weeks. And then again for another four weeks. He said after that, I could fight like a professional. If there is a part 2, I will go through this routine and become a professional before I start acting in it. Was Mugamoodi your first action film? Yes, it is my first real action film. It is an action film that has Indian sensibilities. Ko also was an action film, but more of a defensive action film. This is different. Here, the guy goes and fights with the bad guys. I enjoy action films but I don't like anyone beating me up. I like to beat up the other guys! (laughs). How exciting was it for you to get into the superhero costume? Not at all exciting. In fact, it was such a pain. The costume was so heavy that I couldn't eat, sit or stand properly. Everything was painful, though after some time, I got used to it like one gets used to the mad Chennai traffic! But it was too stressful. I also developed neck pain from which I am yet to recover. The costume was a hindrance to action and also my day-to-day activities. Still, you are game for Mugamoodi 2? That is, only if they find a lighter and friendlier costume! That is my condition, and I have told Mysskin too! I must tell you, when you wear the superhero costume, you really feel powerful! At the same time, it made me so angry and irritated. It was like Jesus carrying the cross. Most of the shooting was at night and I felt so dehydrated and tired. It was one of the most strenuous and tough roles I have done. You need to have a strong mind and very good fitness level to do such a film. How did you celebrate once the shooting got over? The last bit was a song in Switzerland, and after the last day's shooting, I gave a huge party for everyone. I have quite a few friends there. I invited them too. You also had sleepless nights during the shooting? Yes, I had sleepless nights, and many sleepless days as I was shooting for Mugamoodi at night and for Gautham Menon's film in the day. I shot for 80 nights and my whole body clock went for a toss. After that, I went straight to Bejoy Nambiar's David and one day, my back was so bad that I couldn't move and I collapsed. I had to cancel two days' shoot. When do you plan to take a break? I am winding up Gautham Menon's Nee Thane En Ponn Vasantham. I have been working continuously, without a break, for the last one-and-a-half years. Before I get a divorce notice from my wife, I have to take a break! What is the next film you have signed? I have signed a dozen films including Ravi K Chandran's first directorial venture. I am so happy. I have waited for this day. I am so humbled and overwhelmed to get these offers. When you started with offbeat films like Ram, Kathrathu Thamizh, etc, did you expect this kind of a transition in your career? I wanted to do those kinds of films but it is not possible to do a Ram or a Kathrathu Thamizh all the time. After that, I tried masala films. I want to do all kinds of films. I don't want to do the same kind of roles again and again. It bores me and also the audience. I try to choose roles that are interesting to me. David was super-cool and super-interesting. I like Bejoy's very urban way of telling stories. I will be working in his next film too.